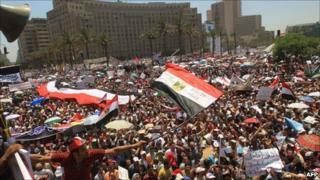 Tens of thousands of people have packed Cairo's Tahrir Square, after the first call by Islamist leaders for nationwide demonstrations since President Hosni Mubarak was overthrown in February. Many protesters - dominated by Muslim Brotherhood supporters - are calling for an Islamic state and Sharia law. Tensions have been running high between Egypt's Islamist and secular groups, who are at odds over the transition to democracy in the Arab world's most populated country. Later there were a number of casualties when violence broke out in a separate incident in Sinai. "We have two bodies of civilians in the morgue now and 12 police conscripts being treated for injuries in hospital," Hisham Shiha, Egypt's deputy health minister, told state television. Around 100 armed men drove around the city of El-Arish, shouting Islamic slogans, and firing into the air, before attacking a police station. Terrified residents fled into their homes. One of those killed was a 13-year-old boy, according to reports in the local media. Among the earlier protests in Tahrir Square, liberal groups called for guarantees of a constitution that will protect religious freedom and personal rights, whereas Islamists demanded speedy elections and a recognition of Islam - in one form or another - in the new Egyptian state. Now the Islamists want their voice to be heard and are showing their muscle for the first time since Mr Mubarak stepped down on 11 February, says the BBC's Jon Leyne in Cairo. Although the Muslim Brotherhood can turn out huge crowds by rallying its supporters at mosques, it does not necessarily represent the majority of Egyptians and is predicted to win around 20% of the vote in an election, our correspondent says. There was little sign of any secular groups at Friday's rally, he says, adding that it will be interesting to see how they re-group after today's events. Since early July, the mainly secular protesters had camped out in Tahrir Square - the epicentre of protests that toppled Mr Mubarak - to denounce the ruling military council over the slow pace of reform. Islamist groups had for the most part stayed away from the sit-in. Last week, they held their own demonstration and accused the Tahrir protesters of going against the country's "Islamic identity", the AFP news agency reports. But with Islamists and the more conservative Salafist groups now filling Tahrir Square, it could mark a turning point in Egypt's post-revolution period, our correspondent says. Later on Friday, witnesses in el-Arish reported men in trucks and on motorbikes firing their assault rifles into the air and forcing frightened residents into their homes. The men are reported to have been confronted by policemen and soldiers.